August was a busy month for EPRC, because 3 cases of confiscations were made across the land of Vietnam. Until now, the rescued primates are still in good condition and under careful supervision in the Quarantine Area of Vietnam. 1. A female yellow-cheeked gibbon in Nam Dinh. We found her in a tiny cage at Nam Dinh Head Ranger Quarter. First confiscation was at the end of July – beginning of August. We received a call from Head Ranger Quarter in Nam Dinh province about a female gibbon. EPRC staff immediately go to the city which is 2 hours away from our center and picked up the gibbon. Her health condition is not bad, but it seems that she was fed a lot of milk which is not good for such an adult gibbon. The cage from Head Ranger Quarter was too small for her, so we moved her to our special Transfer Box. After 5 hours (due to paperwork + transportation time), she arrived at EPRC safe and sound. She likes to swing on her bamboo hammock. This confiscation is similar to many other cases EPRC did before as there is not much past information about the individual. However, by inspecting her behavior and condition, we think that she was kept for a long time as a pet at a wealthy family. She has the habit of turning her back towards humans to ask for backrub. 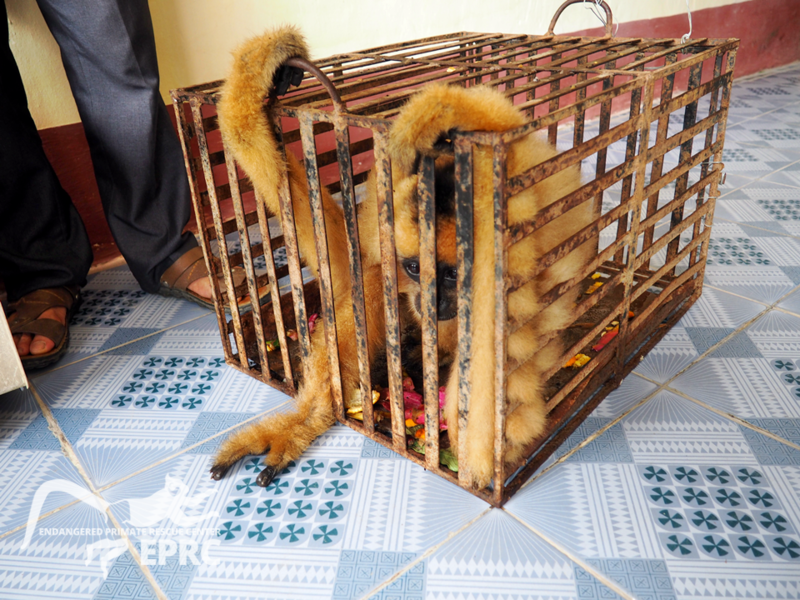 Because of that, EPRC staff try to ignore her will to make her independent from human again. 2. Six lorises in Soc Son. In August, EPRC went to Wild Animal Rescue Center Hanoi based in Soc Son to pick up 6 lorises: 5 pygmy lorises and 1 slow loris. Because this rescue center is being under renovation, their enclosure for small animals is a bit hot. Therefore, we decided to welcome new members to EPRC. They are all in pretty good health condition, just 4 pygmy lorises are a bit underweight. The female slow loris has her health checked. Hue – our Head Keeper is releasing a pygmy loris to her temporary enclosure in the Quarantine area. 3. A male red-shanked douc langur in Hue. He has scratches all over his face and it is swollen too. The last confiscation at EPRC in August (until now) is in a far-away place: Phu Loc province of Hue city (in the Central Vietnam). The news of an injured red-shanked douc langur came to EPRC at late night of August 15th and we immediately sent people to pick him up. As he arrived at EPRC, his health condition was even worse than we thought. His face was full of scratches (for unknown reason) and it was swollen, too. This condition indicates that he was having digestion problem, and the fact that he didn’t poop at all during 1,5-day trip from Hue to Ninh Binh clearly proved that. His body is super slender, so the information we got from the citizens was probably not correct. They said that the douc langur ran into their house after a dog chase, and then they immediately called the Head Ranger Quarter in Hue. He is now still in the Quarantine Area in EPRC and under our detailed inspection everyday. Good news is he can eat more now and his faeces quality is getting better. These animals are still in need of help from kind donors. Please direct to this link to DONATE or SPONSOR. On behalf of these poor primates, EPRC staffs would like to send the most sincere Thanks to all of our supporters, financially and emotionally!